Note: Some content described in this release may or may not be available with your package. Please contact support or your Advocacy Coach if you’d like to learn more. Is there a feature you’d like to see in the hub? Let us know by adding it to the Influitive Feature Request Trello board! There you can also vote for features requested by others, as well as see what features are currently on the roadmap. Administrators can now visit reports and see the performance of any emails they have sent out from their Hub. There are two new report tables on the Overview tab of reports: Email Delivery and Email Bounces. The Email Delivery table gives a breakdown of how the different email types performed over a selected time period. Administrators can see how many emails were sent, successfully delivered, opened or clicked on by advocates. The Email Bounces report provides insight into emails that did not go through. In this table you will find a list of advocate email addresses that bounced and details into the why the bounce occurred. This list can help identify incorrect advocate emails and which advocates have unsubscribed from the program's communication. You can read more about email reporting in the help article. Bulk Challenges is a redesign of the current challenges tab which aims to make managing challenges simpler. It allows administrators to archive, publish and schedule, unpublish, or export multiple challenges at once. If you haven't tried it already, check it out - you may find it to be a real timesaver! 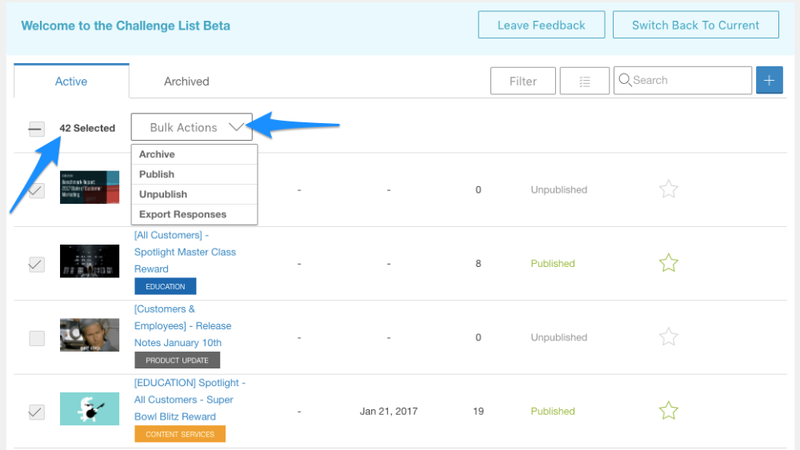 Administrators can now apply bulk actions to up to 50 challenges at once. This update makes it easier to manage season-based campaigns or experiences containing multiple challenges. This improvement comes as an addition to the changes announced in the last release note. 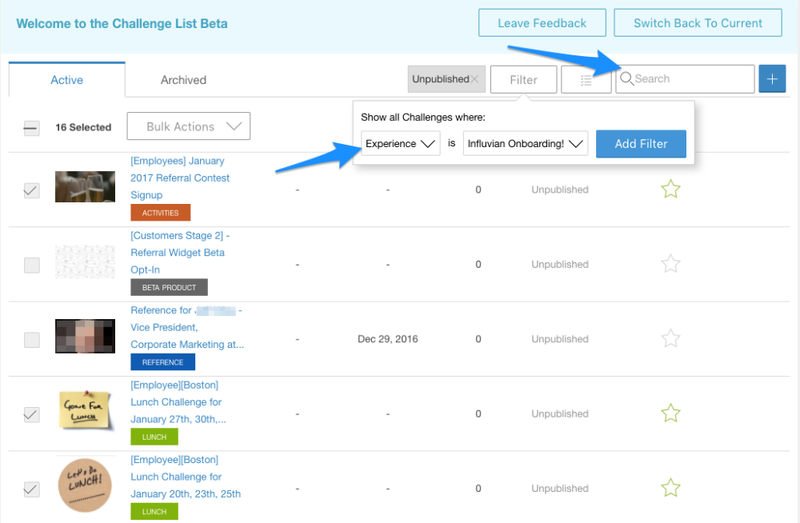 Namely, the text search bar to help admins find specific challenges, and improved filtering of the challenge list. You can find more information about this feature in the Bulk Challenges Beta help article.